Ah, grill season. So many awesome recipes pop up this time of year, but it leaves us grill-less individuals twiddling our thumbs. If the grill masters have you craving a juicy steak but you aren’t keen on heating up the entire house with the broiler, just whip this baby up stove-top. Perhaps the single benefit stove-top steak has over grilled steak is the opportunity to finish cooking it in basting butter. You can, of course, use plain butter, but whipping up a flavored butter is such an easy way to change up your steak on a whim. 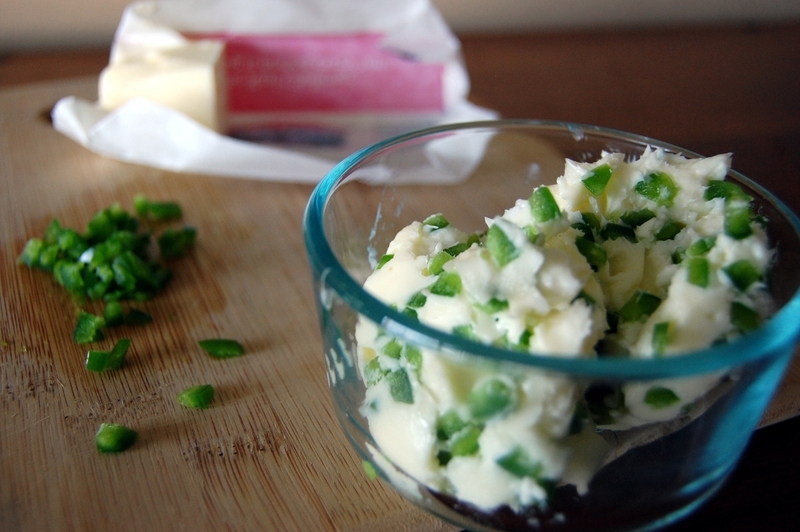 I used jalapeno butter here, but you can create whatever kind you like – let the butter soften, add your favorite herbs/spices/finely chopped or minced veggies, and pop it back in the fridge. You can make this well in advance if you trust your ability to resist eating all of it on toast. 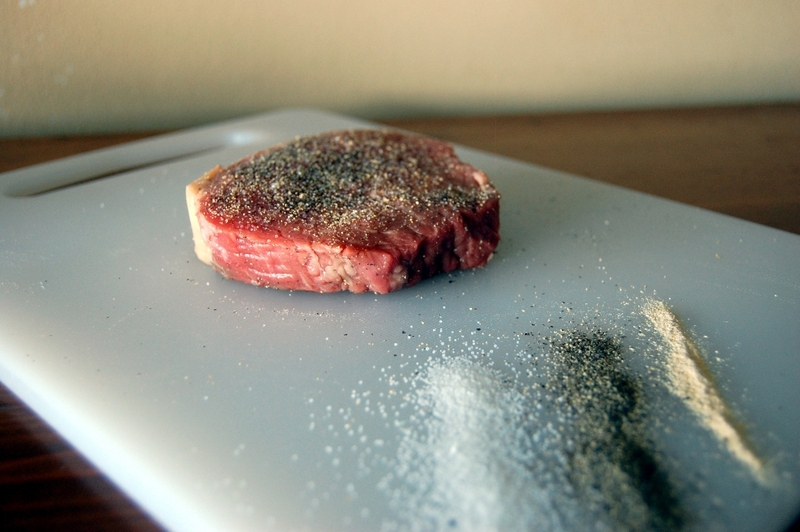 Season your steak as you like – I went with salt, pepper, and garlic powder, a relatively neutral base that will work well with the jalapeno flavor. Experiment until you find the combo you like best! 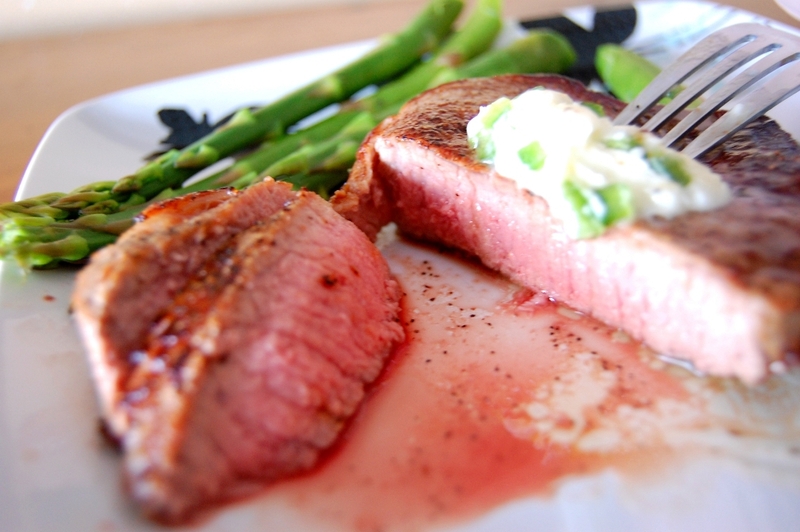 …finish in your flavored butter, tipping the pan towards the steak to spoon pooled butter over the top. Pull it off the heat at your desired done-ness (would you say this is hovering somewhere around medium?) and top with another blob of butter. Now get your grill-less carnivore on! 1. Allow butter to soften. Finely chop jalapeno (remove seeds and stems for less heat). Stir into softened butter. Return butter to fridge to harden. 2. Heat a pan over high heat. Add oil to lightly coat pan. Place steaks into oiled pan and allow to cook to desired done-ness on each side (take care to flip only once during cooking). 3. In final 30 seconds of cook time, add approximately 2-3 tablespoons of jalapeno butter to pan. As butter melts, tip the pan towards the steaks and spoon the melted butter over the top of the steaks. 4. 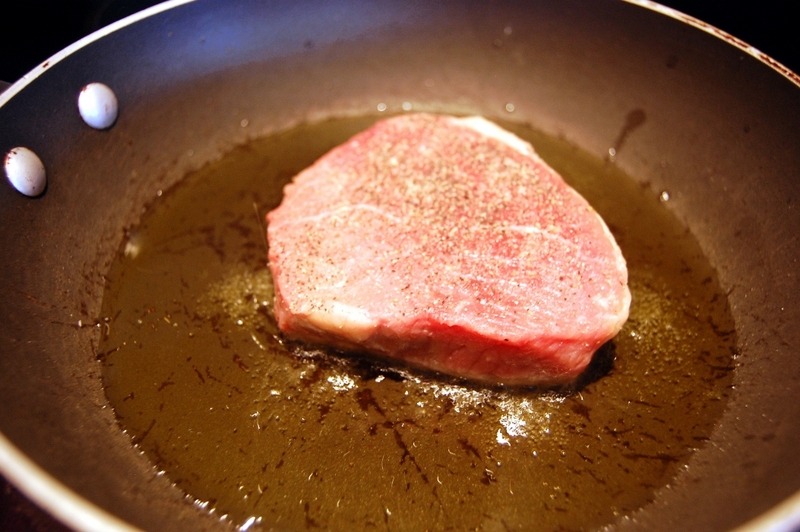 Remove steaks from pan and allow to rest approximately three minutes before serving. 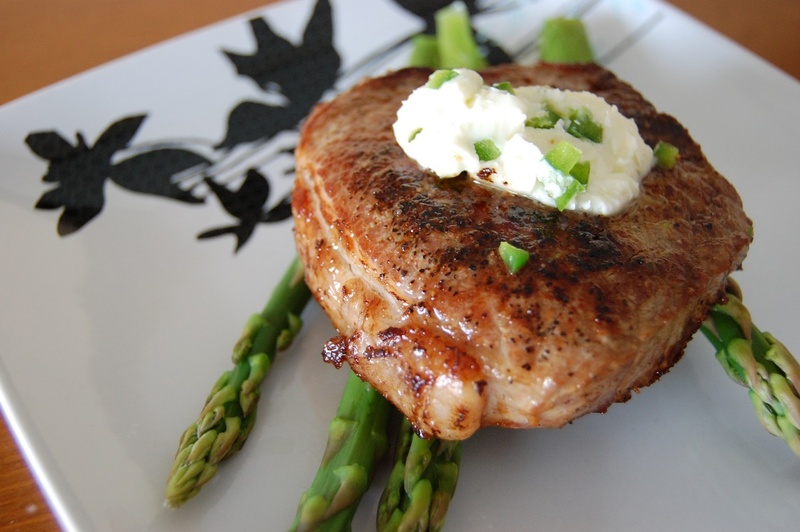 Serve with additional tablespoon of jalapeno butter over each steak. This entry was posted in Beef, Dinner, Meat and tagged Beef, Cooking, Dinner, Food Photography, Photography, Recipe, Steak by Lazy Suzan. Bookmark the permalink. I agree! Love herb butters on all kinds of stuff, actually. 🙂 Thanks for stopping by, Michael! Great pictures and really well written!! Wow this looks delicious. Also I love your pictures and the presentation. 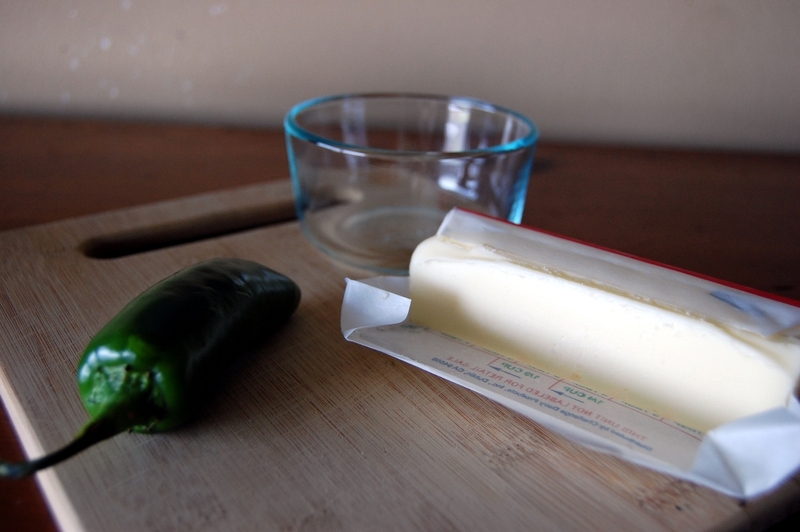 I make compound butters all of the time but never have I thought to make one with jalapeño. Such a great idea! Thanks for sharing. It’s one of my favorites 🙂 thanks for stopping by!! I don’t eat meat, so I’ll just eat the butter! Yum! It’s great on everything! I like to toast up some slices of bread in the oven and snack on it 🙂 Thanks for stopping by! Oh that sounds delicious! You’re very welcome! 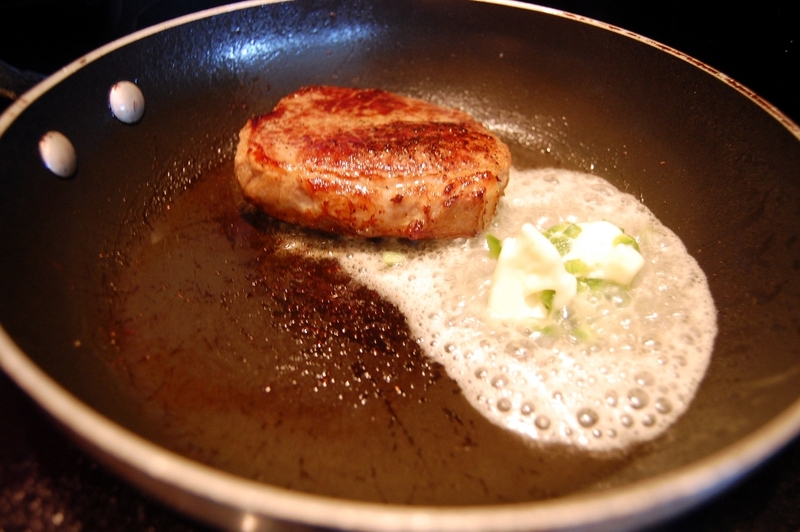 I often pan-fry steaks, especially in the winter. But the jalapeno butter — now that would put it over the top. YUM. OMG, steak and butter…my two favorite food groups! Nicely done! Haha! So yummy. Thanks for commenting! Dadgum that looks good! I had a slim jim for dinner tonight. Haha I have a weakness for slim jims..
Oo, I’ve been trying out different flavoured butters on steak lately and this one looks great! Thanks for sharing. 🙂 The food looks delicious and the photos are great. Will be visiting your blog more often. Cheers! I’m making surf and turf for New Year’s Eve dinner this year, and thought about using a flavored butter. He-Man would love this one. I purchased a stovetop grill earlier this year and love it. It’s a grill for meats on one side and flat on the other side for eggs, pancakes, crepes, french toast, tortillas etc. I love it! I use it more than broiler these days. I got the Lodge stovetop grill. It’s a bit of work keeping it seasoned, but yes, well worth the investment. Like a cast iron skillet is. 🙂 Happy New Year!